· Stay indoors in a warm area. If heat is not available, a warming center near you can be located at https://ogi.oa.mo.gov/DHSS/warmingCenter/index.html or you can obtain these resources by dialing 2-1-1 for United Way Referral. · Check on your neighbors, especially senior citizens and disabled adults. Make sure they are using adequate and safe heating sources. The state’s toll-free, adult abuse and neglect hotline (1-800-392-0210) can be used to report any elderly persons or adults with disabilities who may be suffering from extreme cold temperatures and need assistance. This hotline is operated 365 days per year from 7 a.m. to 12 a.m.
· If you do have to be outdoors, dress in several layers of loose-fitting, layered and lightweight clothing. The space between these layers works as insulation to help keep you warmer. o Wear water resistant boots and something on your head. o Protect your ears and face. Wear a scarf to help protect your lungs from cold air – it will also protect your ears and face. o Schedule outdoor activities during the warmest part of the day, usually 10 a.m. to 3 p.m.
o Carry extra clothes with you such as socks, gloves, hats and jackets so you can change them if they get wet. 4. 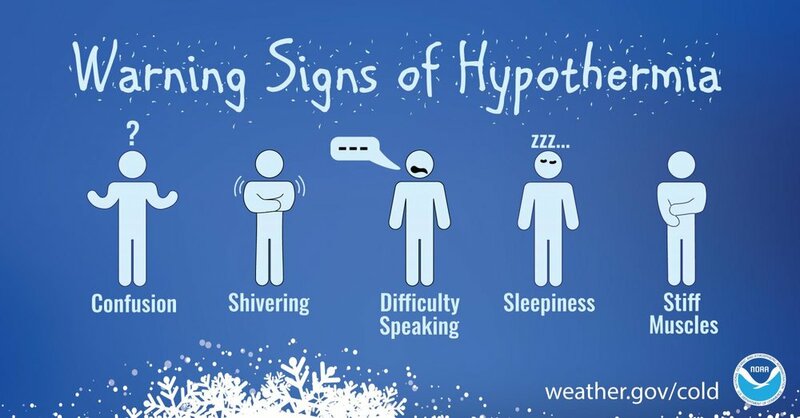 · Watch for signs of frostbite and hypothermia. Don’t forget your emergency winter car kit! Learn more here! 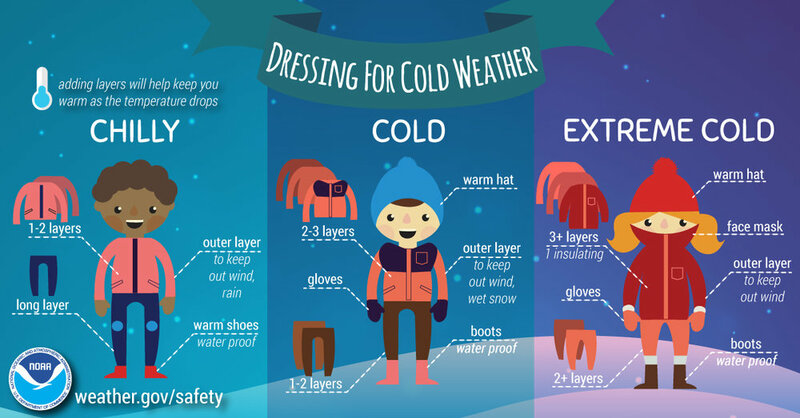 For additional information regarding extreme cold safety tips, visit http://health.mo.gov/living/healthcondiseases/hypothermia/index.php or give us a call at 636-797-3737.